Frank Allen joined UCF Libraries in 1998. 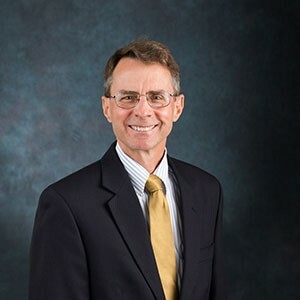 He directs the Libraries’ fiscal operations and facilities management, and has divisional responsibilities for Circulation Services, Rosen College of Hospitality Management library, library human resources, and UCF Connect Library Services. Before coming to UCF Allen was head of Administrative Services for Virginia Commonwealth University Libraries in Richmond, Virginia. He received his Master’s of Library and Information Science (MLS) from the University of Tennessee, Knoxville. He holds an MBA from the University of Texas, Austin, and a BSBA in Finance from the University of Florida. Allen’s recent professional activities include serving as co-editor for a wiki-format resource guide for planning library buildings and learning spaces (produced by ACRL/LLAMA Interdivisional Committee on Building Resources) “Academic Library Building Design: Resources for Planning.” He has published articles in College and Research Libraries and Library Leadership and Management, and serves as invited referee for College and Research Libraries and the Journal of Academic Librarianship. His research interests focus on library facilities planning and the economics of information.